Moss Building & Design is hosting a design event Thursday, April 27th for local homeowners. Design processes can be intimidating, and we want to show guests how to make it a fun, collaborative, and engaging experience. 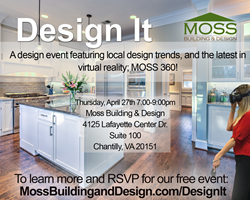 On Thursday, April 27th 2017, Moss Building & Design is hosting an exclusive event for local Northern Virginia homeowners. MOSS will be presenting their latest Design It workshop, with a twist. The event serves as an opportunity for people to ask their personal home design questions to the experts at no cost. MOSS designers, architects and sales consultants will be available before the presentation to discuss neighborhood trends, learn about the MOSS design process, and discuss any space and living concerns. The area's top designers will be there to discuss the latest trends as well as attendee's possible projects. The Design It workshop offers the chance to see how to begin a design process, learn about the latest trends, and experience the state-of-the-art virtual reality design capability, MOSS 360. MOSS 360 is the virtual reality remodeling capability that allows homeowners to “walk through” their proposed design and be sure everything is exactly how they want it before construction even begins. This tool is unique to Moss, and attendees have the opportunity to win their own architectural concept design with it in the raffle. Other raffle prizes include a free handyman for a day and more. "We are so excited for the opportunity to offer advice to potential clients as well as local 'do-it-yourselfers'," says Marketing Manager, Carly McAlister. "Design processes can be intimidating, and we want to show guests how to make it a fun, collaborative, and engaging experience."